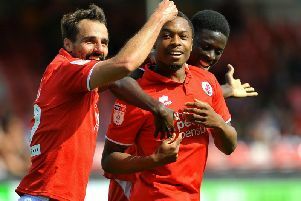 Crawley Town director of football Selim Gaygusuz believes both himself and rookie head coach Harry Kewell will bring success to the club. In a national press article published today he spoke about his background and why the duo were selected by Turkish owner Ziya Eren to take the club forward. Gaygusuz’s route to the top of a League 2 club came via a path which included working as a football agent and for a bookmakers. He was then Crawley’s director of marketing before landing the influencial job of director of football. Among his achievements has been the recruitment and selling on for a profit to Luton Town of the club’s topscorer from last season, James Collins. The half-English, half-Turkish confident of Mr Eren told The Sun newspaper: “I used to be a football agent from since the age of 21. He told how he had got his job at a bookmakers: “Because I know football. If you tell me any player in Europe, I’ll probably give you his background, his transfer fee, his agent’s name. “A good thing going from football agent to becoming a director of football is you know recruitment. “You know what to do. I was 21 when I was controlling a player on 200,000 euros a year. I used to give him advice on what to do. Gaygusuz admitted Champions League winner Kewell stood out from the many other candidates who applied for the Crawley Town head coach job. He said: “Harry impressed with his passion and hard work. He played in Turkey as well. “His previous team-mate at Galatasaray was also our chairman’s manager in the Turkish Premier League, so he gave a good reference. “I believe in everything Harry came up with. Our time with Harry, we’re looking to go long term.